panafoot: Here comes the sun! 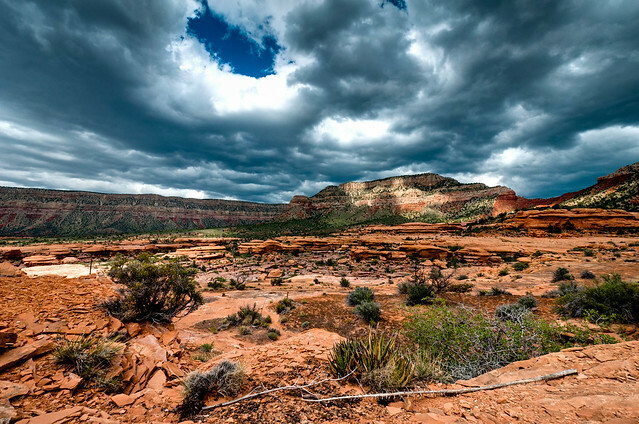 After a year of being in areas of North America that were experiencing higher than normal levels of rainfall we have thoroughly enjoyed the time we have spent so far in the southwest US. We have traded the moss from behind our ears for sand between our toes. 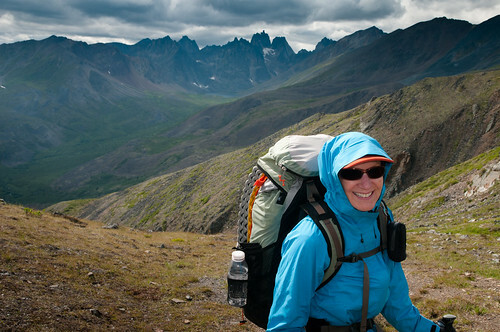 Last July after spending an entire day hiking in windy rain in Tombstone Territorial Park in Yukon, Canada I vowed that I’d never complain about heat again. 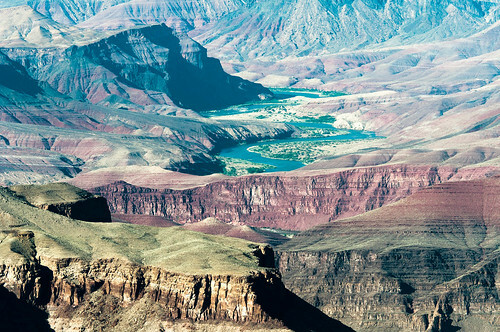 Well…I did try but that was before we spent time within the Grand Canyon in Arizona. 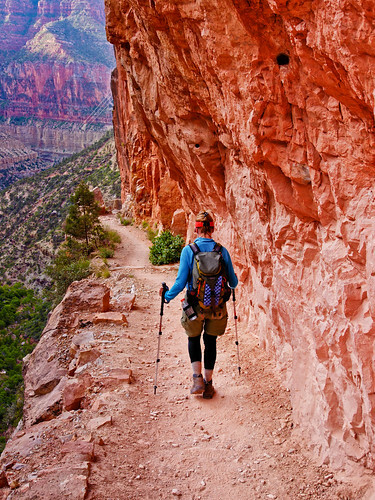 Hiking in the Grand Canyon is unlike anywhere else we’ve been. 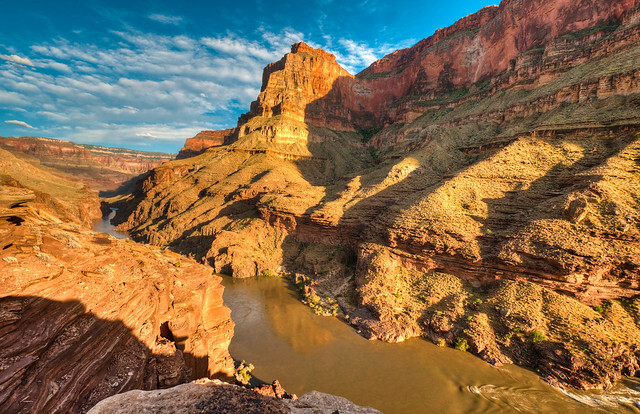 It’s a mountain in reverse with the hardest part, the ascent, coming at the end and with the potential of blistering temperatures at the “summit.” The Park Service is adamant that one cannot hike from the rim of the canyon to the Colorado River and back to the rim in one day. Unfortunately too many casual hikers are lured into the canyon by the cooler temperatures on the rim and easy downhill trails but they are totally unprepared for the increased heat in the canyon (20 degrees higher than the rim), the steepness of the uphill trails and the altitude (~7,000 for the south rim and ~8,000 for the north. Trailheads are marked by prominent signs with dire warnings about the dangers of heat exhaustion, heat stroke, the number of heat related emergencies the Park Service responds to each year etc. The “poster child” of what not to do is a 24 year old woman, a former Boston Marathoner, who died of dehydration in the canyon in 2004. …and from the river for people on boats. But the best experience by far comes from moving through the different levels from rim to river. We had several great opportunities to do this. 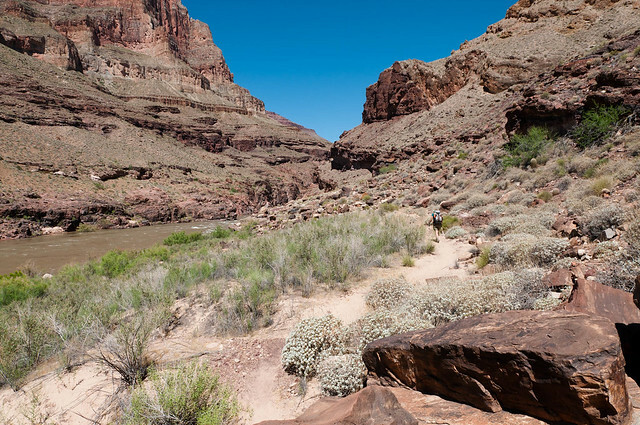 The first was when we went against Park Service advice and dayhiked down the South Kaibab Trail with the intention of going to the river and coming back up in one day. Of course one does not have to go all the way to the river to get great views. 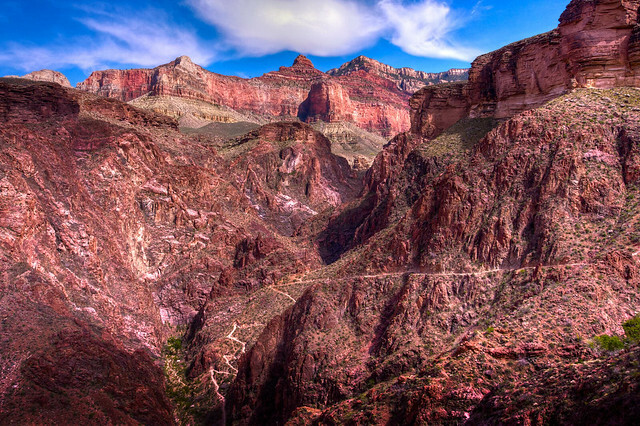 The South Kaibab is said to be the best constructed trail within the park and these switchbacks attest to that. The excellent trail construction is maintained all the way to the river. 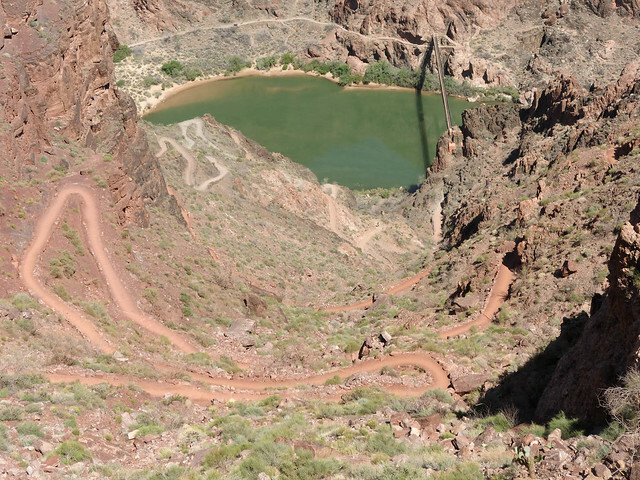 ... the side canyon that is home to Phantom Ranch where we planned to take a well earned break and get something cold to drink. 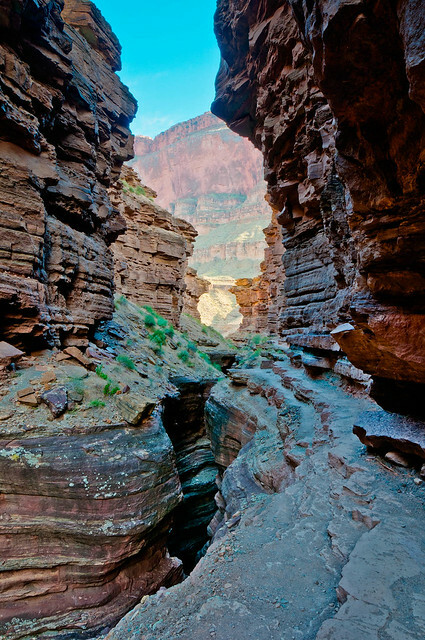 ... before climbing out of the canyon on the Bright Angel Trail. We took another break at Indian Gardens. 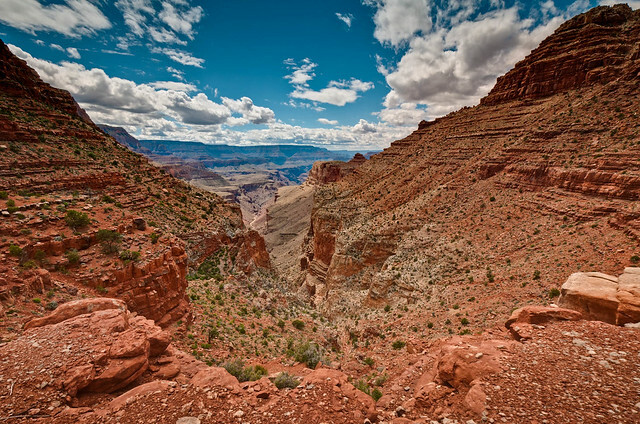 Had we more time and energy we could have done the short hike out to Plateau Point. But we figured doing 18 miles with ~4800 ft of elevation loss and ~4400 ft of elevation gain was enough for one day. This was a challenging hike but we found this quite doable. 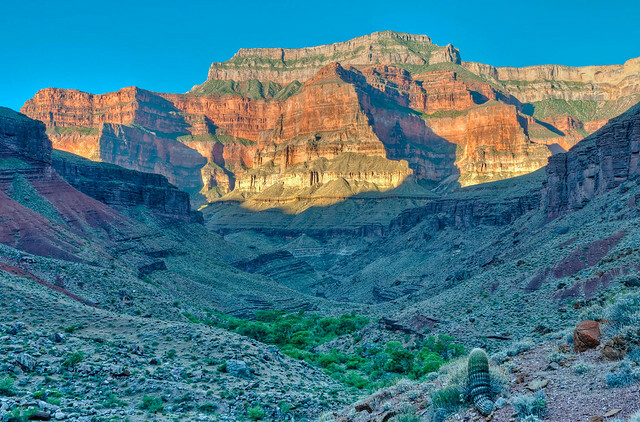 We were in decent shape and we carried enough food and water (there is no water available on South Kaibab). Fortunately, temperatures in the canyon were not extreme, only in the mid 90’s. We both possess some mental "toughness" but most importantly we have a great aversion to being "rescued" and becoming a statistic so we were motivated to keep putting one foot in front of the other. Still it was a great relief to finally reach the trailhead. Photos from this dayhike (and others) are on Flickr. 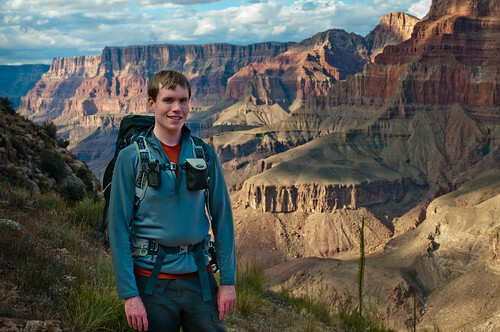 Our son Dan then came for a visit and joined us for a 4 day/3 night backpack trip in the southeast portion of the canyon. It was nearly mid May. 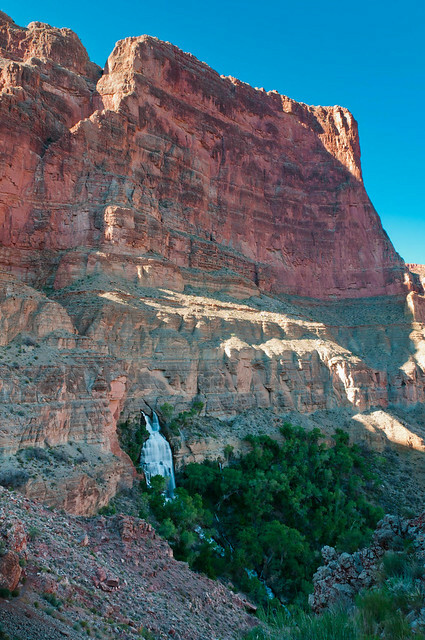 We had hoped to do this trip earlier in the season when temperatures in the canyon would be milder. However, we were constrained by Dan's work schedule. But it was a worthwhile trade off in order to have him with us. 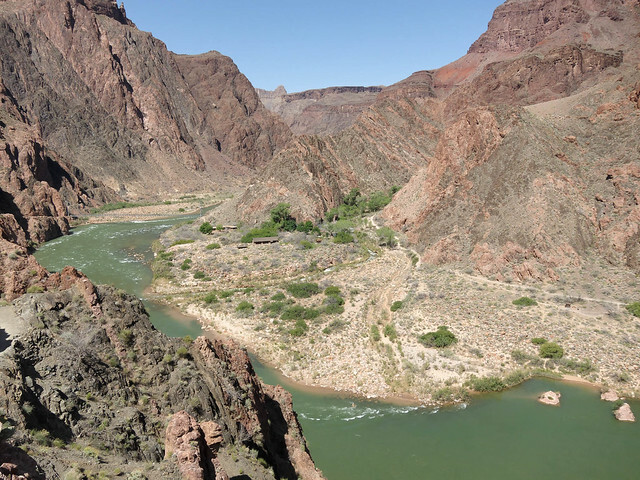 Had he been able to take more time off we could have considered also doing the Beamer Trail to the confluence with the Little Colorado River in conjunction with this trip. We would be descending into the canyon via the Tanner Trail. The trail description says it is 9 miles but our map and this Tonto Trail distances grid indicates it is 7.8 miles. Either way there is 4650 ft of elevation loss. 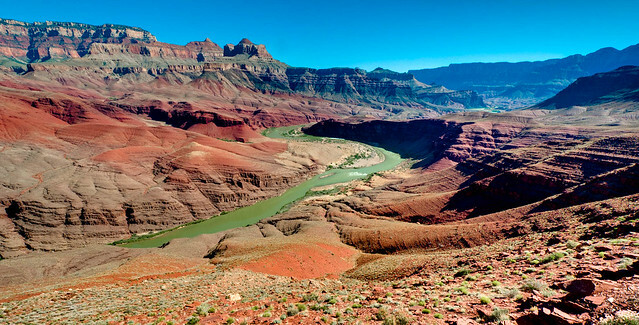 We would then travel downriver on the Escalante Route and climb out of the canyon on the Grandview Trail . In the eyes of the National Park Service the trails and route we would be on were recommended for "experienced canyon hikers" but none of us were with the exception of some recent dayhikes. However, we were all experienced backpackers and felt up to the challenge especially after seeing the stunning views. We got a late start the first day, about noon but as it was all downhill so we didn't that would be a problem. However, early on the Tanner Trail is steep and loose and was murder on my knees so it was slower going than we had anticipated. Fortunately the trail moderated some and the going was easier but there were still places where one needs to be very careful. Of course we also were slowed by the many photo opportunities. ... especially as the sun got lower in the sky and dropped below the clouds. It was dark by the time we reached Tanner Beach and there were several other individuals camped in the the area of established campsites. So we continued down river a bit and cleared enough rocks on the beach for our tents. We slept late, which is not the best idea as cooler temperatures are better used for hiking than sleeping, but our leisurely morning allowed us time to appreciate the scenic location. ... there are parts that are more challenging (especially for someone like me with a fear of heights and lousy balance). The printed route descriptions were dubbed “Worry Papers” by John because they tended to make me worry. 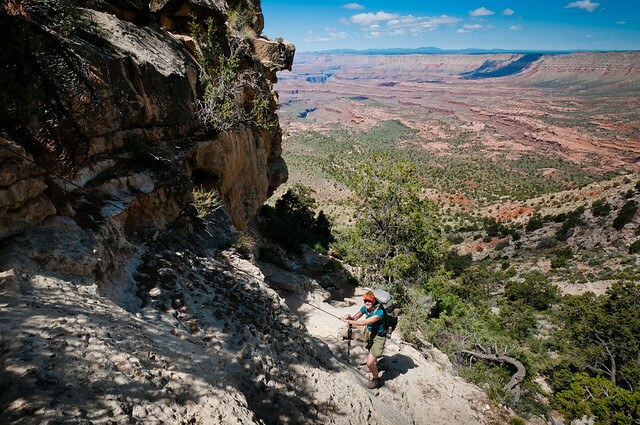 the one for the Escalante Route contains information such as “…a serious fall is a real possibility…” “…missteps should be avoided at all costs…” etc. 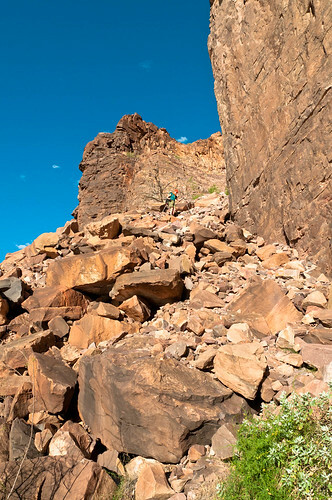 I kept an anxious eye out for the hazards described but my confidence grew each time I successfully negotiated one such as this section of sloped narrow trail covered in loose rock adjacent to a long steep drop off. But the views make it all worthwhile. Fortunately route finding was no problem and we didn’t need to use “…well developed route-finding skills…” as it was well marked with cairns. We were able to take a break by the river just above Neville Rapids. Had we gotten an earlier start the previous day we could have gotten this far but that would have made our third day really short. 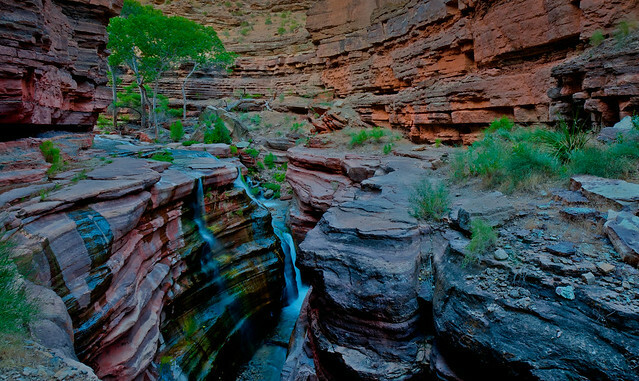 An unexpected treat came after skirting the edge of a the narrow side canyon formed by Seventy - Five Mile Creek. The route dropped into it and we then hiked down the often shady canyon toward the river. 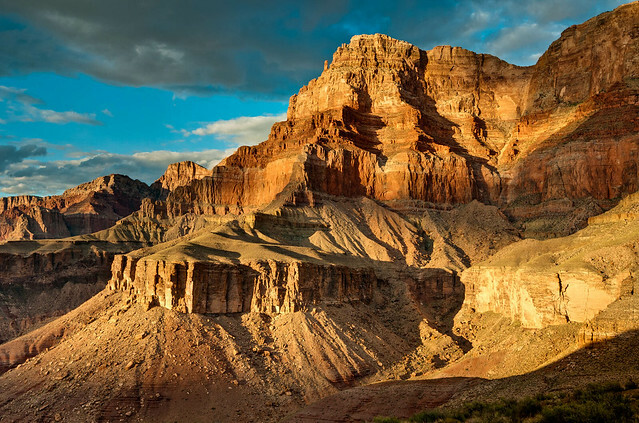 We welcomed the respite from the sun and heat and after the overwhelming open expanse of the Grand Canyon this one felt intimate and comforting. 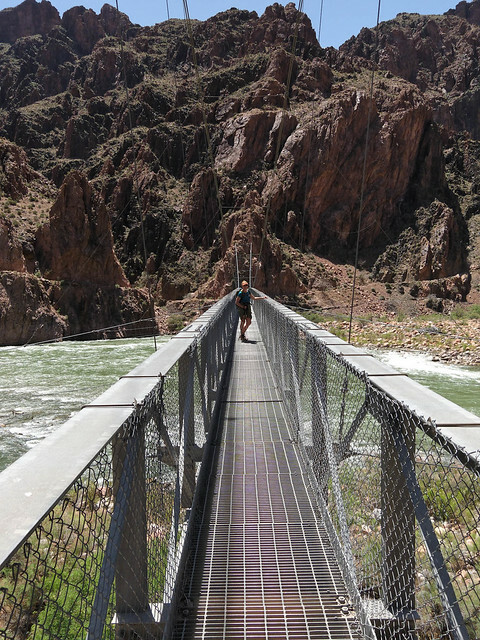 Once out we continued down river toward Papago Creek and our next obstacle. 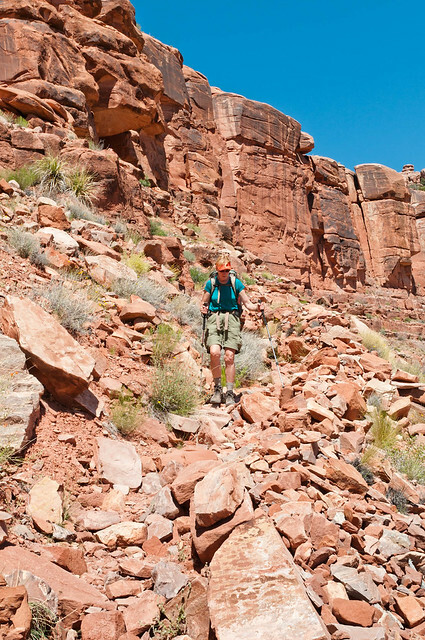 The route requires scaling a series of steep rock ledges for about 35 feet. The route description suggests carrying some rope for hauling packs up however a friend of ours who had once done this route told us it wasn't really necessary. John had little trouble climbing up while wearing his pack but Dan and I both chose to push our packs up to each ledge ahead of us. Whereas John has had rock climbing experience Dan and I did not. However, we both made it up without incident. It looks harder than it actually is. Our next tricky part was where we needed to descend through a talus filled gully. The upper part was looser but the larger boulders lower down were reasonably stable. I didn't like it but got down it without any problems. 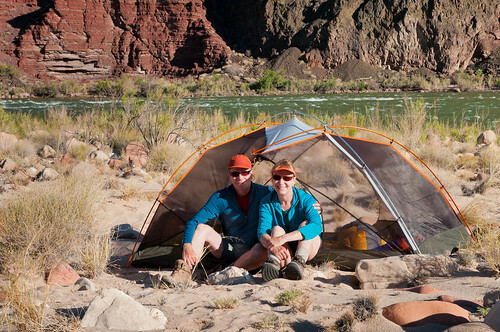 We camped our third night at Hance Rapids in Red Canyon. We had gone 9 miles for the day. 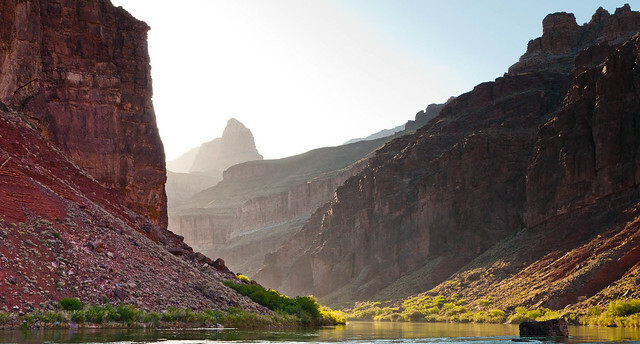 The next morning we got another early start and left the Colorado River to begin the long ascent to the rim. 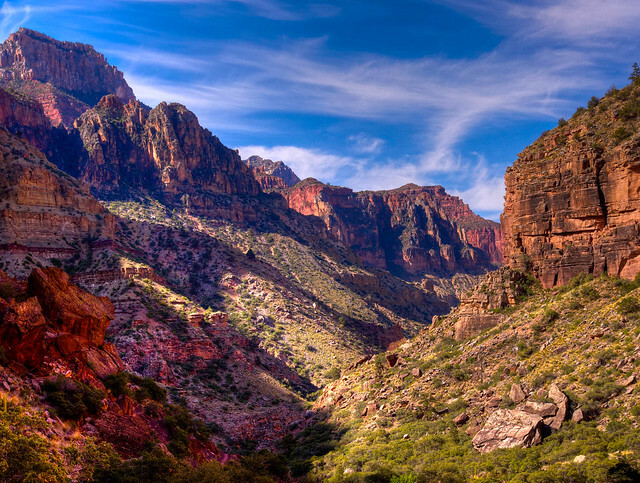 We would take the Tonto East Trail, which begins at Red Canyon, to the Grandview Trail for a total of 11.4 miles. The last day was the hardest physically. When we initially applied for the permit the Park Service strongly encouraged us via a form letter (AKA the “You’re Going to Die!” letter) to take the shorter New Hance Trail out of the canyon stating that trips such as the one we had planned too often result in injury and occasionally even death. We were required to provide more information about our experience and acknowledge that we had been fairly warned in order to be issued a permit. 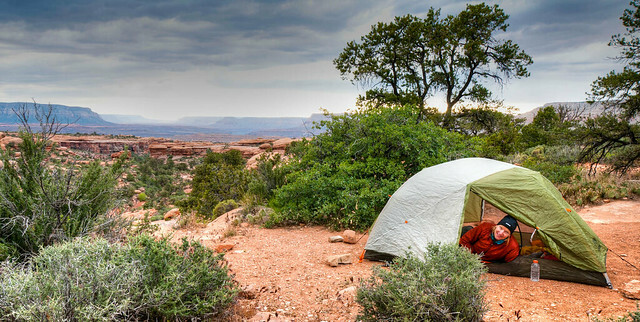 That gave me pause for thought but I needn’t have worried as we later learned that the Backcountry Rangers routinely send this form letter to everyone planning to hike more than 10 miles in one day. ... and there is water available in two shady spots. Hance Creek and Page Spring both provided welcome respites from the heat. In addition the water from both was colder, clearer and better tasting than the Colorado River water we had been drinking. 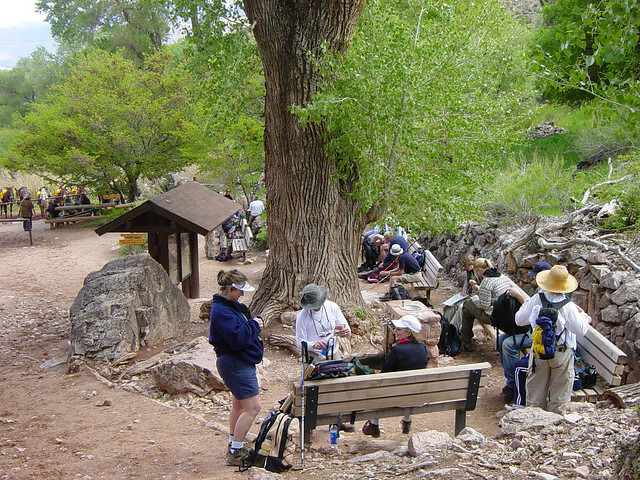 We had also heard that the Tonto and Grandview Trails are more scenic. 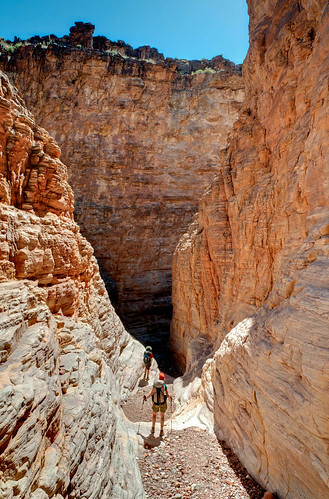 Sure it is really steep in places but that is true of every trail climbing out of the canyon. It was a long day, it took us 12 hours, but all things considered we did fine. All of our photos from this backpack trip are on Flicker. After Dan went home we did something we've wanted to do for a while - hike the canyon "Rim To Rim", starting on the North Rim descending on the North Kaibab Trail, crossing the river and ascending via the Bright Angel Trail; a total of 25 miles with about 5,000 feet of elevation loss and about 4,4000 feet of gain. The logistics are a bit complicated as even though the distance between the North and South Rims “as the raven flies” is only 10 miles it is 215 miles to drive around. 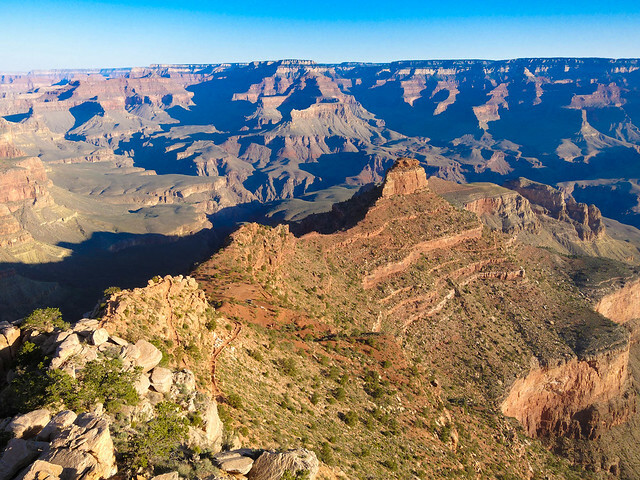 We initially planned to take the "Transcanyon Shuttle" to the North Rim and stay in the lodge overnight however the $350+ price tag changed our mind. Instead we left our motorhome on the South Rim and drove to the North Rim the night before we planned to do the hike, parked on Forest Service land and slept in our car. We arrived at the North Kaibab trail head at 5 AM and were shocked when van after van drove up and dropped off groups of trail runners. We asked one of them if there was some special event scheduled but no, this apparently is now common for weekends in May once the North Rim reopens for the season. They all quickly passed us and we could enjoy the excellent trail in relative solitude. 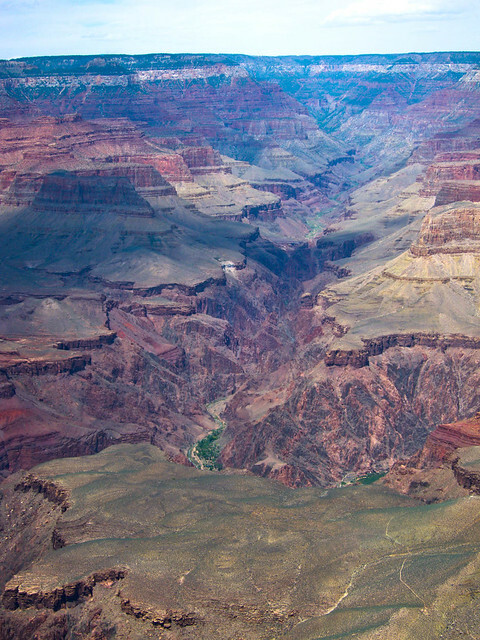 ... and the canyon ahead. 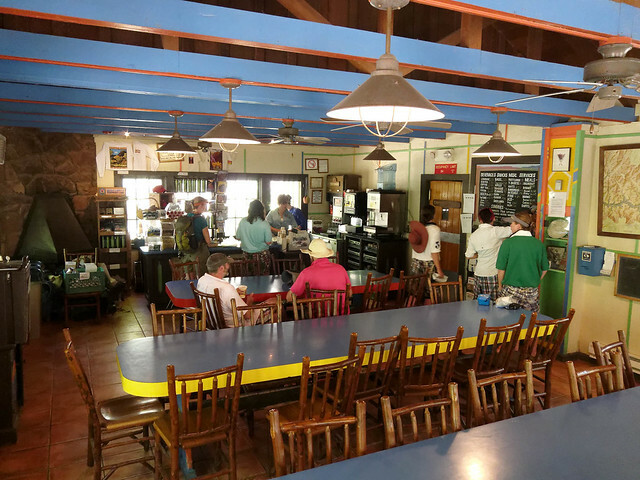 Once we reached Phantom Ranch we were ready for a long break and something cold to drink. 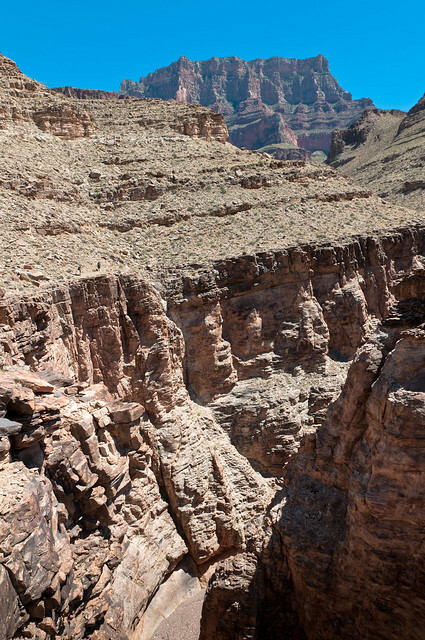 After our break we continued on with the 9.5 miles we still had to go on the Bright Angel Trail up to the South Rim. We took another long break at Indian Garden. Fortunately that late in the day it was not crowded (as in the photo below) and we both were able to stretch out on a bench. We also enjoyed the availability of drinking water. We only had 4.4 miles to go at that point and I was feeling pretty good about our accomplishment. 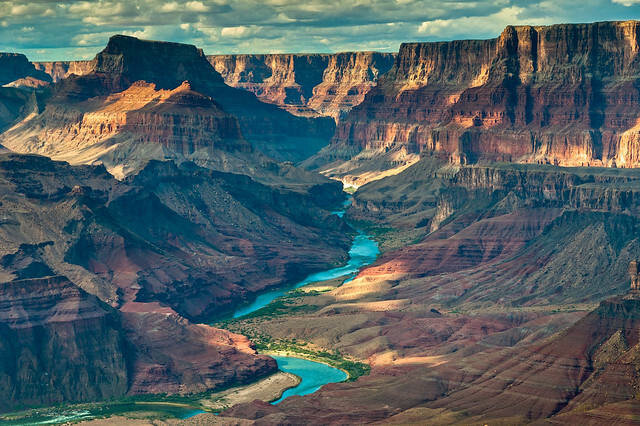 And then I got talking to a friendly grey haired fellow (who had a noticeable potbelly) who mentioned he too had started at the North Rim that morning. 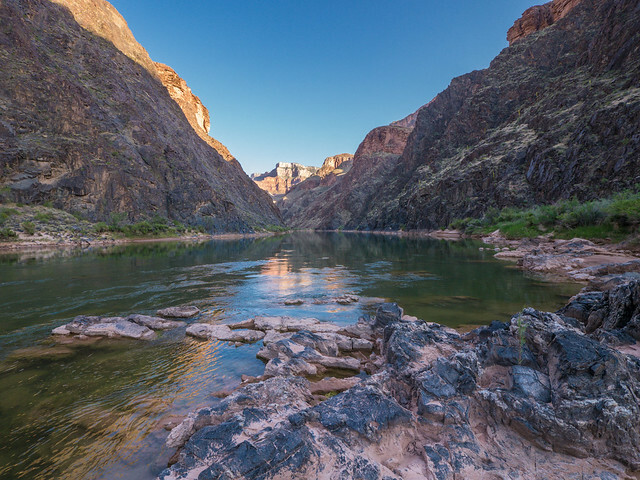 However, he had hiked from the South Rim the day before, spent the night on the North Rim and was now headed back to the South Rim. 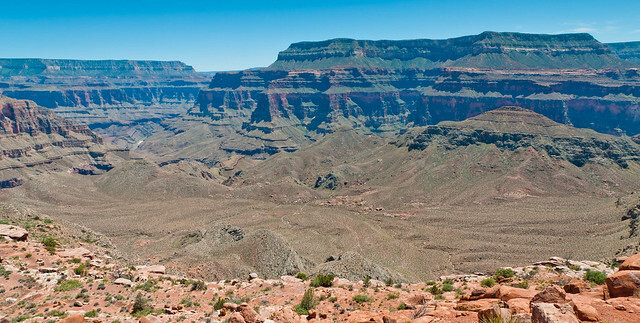 I have since heard that some hearty trail runners complete rim to rim to rim in one day. An impressive feat. 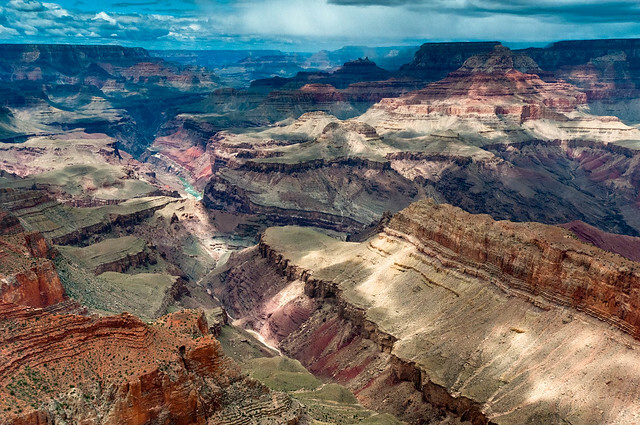 Grand Canyon National Park Service photo by Michael Quinn. All good things must come to an end so we eventually got going again. As the sun was quickly dropping and as we were gaining elevation the air temperature decreased. Once back to the top we retrieved our motorhome, headed to the campground and enjoyed the comforts of home. Photos from this dayhike (and others) are on Flickr. The following day we headed back to the North Rim and retrieved our car. We then began to prepare for another backpack trip this time in the northwest part of the park. We did a 4 day/3 night trip on the Thunder River and Deer Creek Trails and there were two trailheads to choose from. We could start at Indian Hollow and take the Thunder River Trail or we could start at Monument Point and take the shorter, by 2.4 miles, but much steeper Bill Hall Trail to where it intersects the Thunder River Trail. We opted for the shorter way. Even so we had 9 miles to go and would lose 4800 ft of elevation to get to our first campsite at upper Tapeats Creek. ... and there is one tricky spot where it is necessary to climb down some steep rock. John has had some rock climbing experience and had little trouble getting down it even with his pack on. However, at the time I was uncomfortable with trying it myself. Fortunately someone left a rope that seemed strong enough. The below photo was taken on our last day and we were hiking out but you can get the idea. Had there not been a rope I am confident I could have made it down and back up without too much trouble. We continued down until we joined the Thunder River Trail. 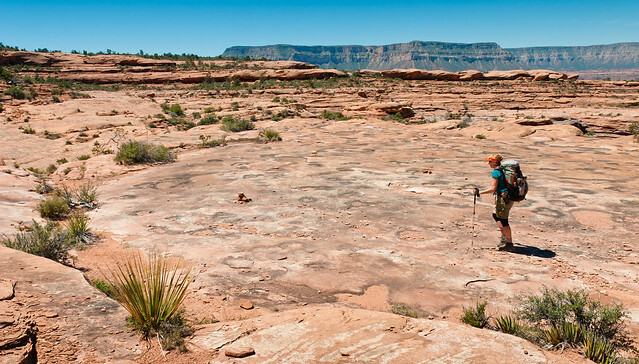 This took us across the Esplanade, a broad flat expanse located between the rim and the river. Our third night out would be spent "dry camping" on the Esplanade. In preparation we both carried an additional 100 ounces of water that we hid in some rocks to use on the last night. Once we reached the edge of the Esplanade we began to get views of Surprise Valley below. The trail became much steeper and could be quite rough in spots. After crossing the broad expanse of Surprise Valley we welcomed the shade as we began dropping into the canyon toward Thunder River. The highlight of the first day was seeing Thunder Springs which improbably shoots out of cracks in a huge rock face. Apparently the volume of water was much higher than normal. The next morning we left our campsite at Upper Tapeats Creek at 6 AM. Unfortunately the high volume of water from Thunder Springs combined with the high level of Tapeats Creek prevented us from crossing it to access the shorter, easier flat trail on the other side. So we had to take the "sketchy seldom used" route instead. 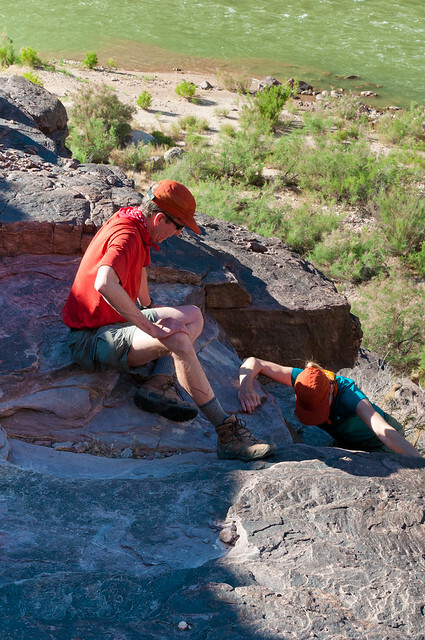 ... we had to do quite a bit of climbing to reach a traverse across an outcrop. 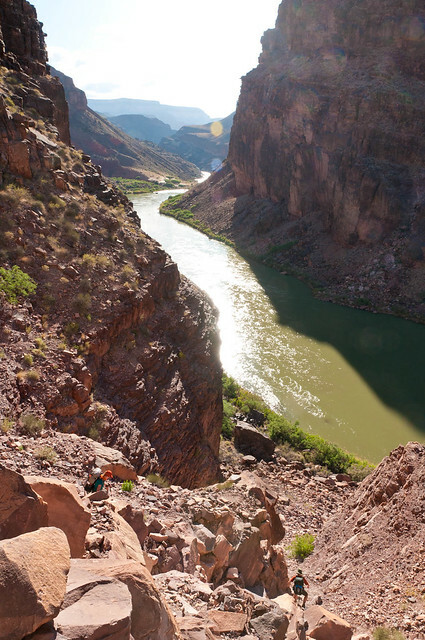 Normally doing a "traverse" sounds easy but the "traverse" on this route contains countless ups and downs before it makes its "precarious descent to the river". The Thunder River Trail Description also mentions the need of 25 feet of rope to lower packs while climbing down some steep rock, something we hadn't brought with us. However, we didn't have too much trouble climbing down it. There is no water available between Tapeats Creek and Deer Creek. Once you get on the outcrop it is impossible to get to the river so we were unable to douse our heads or wear wet bandanas around our necks. We were forced to adopt the strategy of other desert creatures and seek the intermittent shade beside and sometimes even under rocks. We appreciated any rock with enough shade to crouch under. But we persevered, we really had no other choice, and we reached Deer Creek about 1 PM. 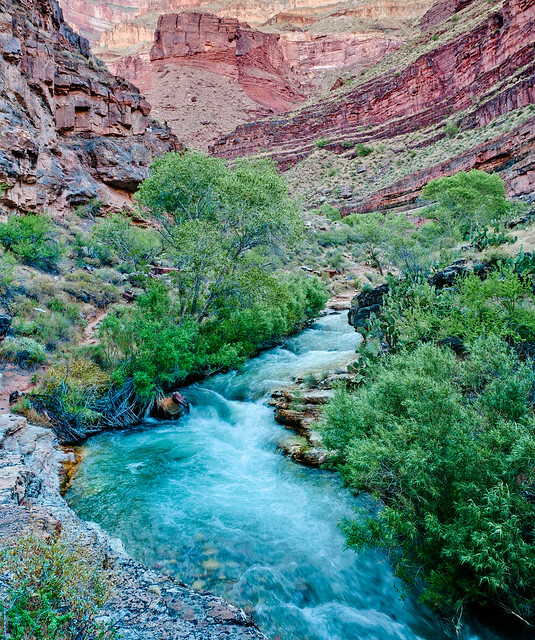 Deer Creek flows through an absolutely gorgeous slot canyon. Unfortunately, at least for us, this is a common stop for river rafters. 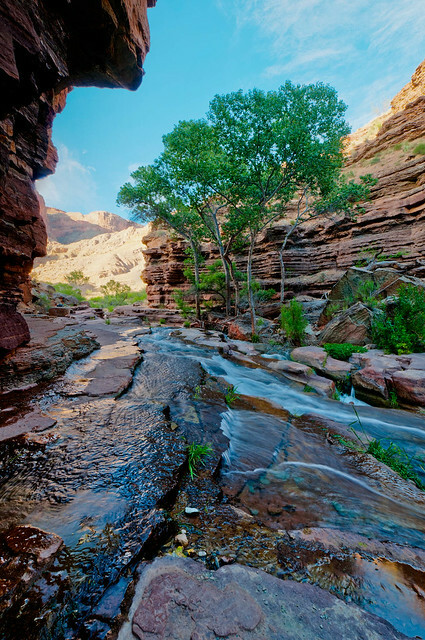 They can make a very short hike up to an area of the canyon known as “The Patios”, named for its large areas of flat rock and cool shade. When we finally arrived we were physically spent and all we wanted to do was rest in some quiet shade, rehydrate and soak our feet in the cold water. Instead we were greeted by the sights and sounds of about 40 people lounging around in all of the available shade or playing in the water. Needless to say it wasn't what we had hoped for and it was a bit disheartening. So we continued upstream to our campsite in some trees and found some adequate shade and water. 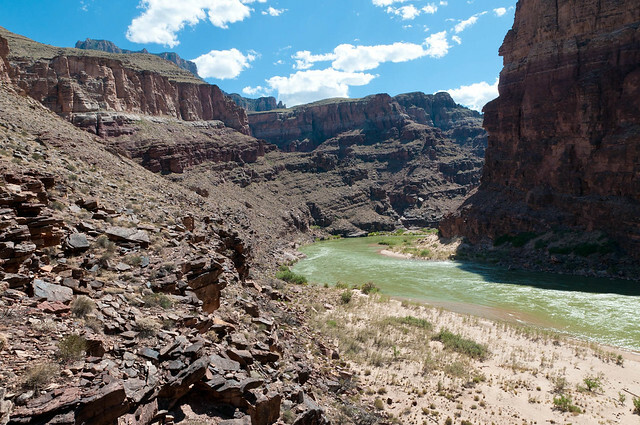 However, later in the day once all the rafters had left to return to their boats to go to their camps we had the canyon almost completely to ourselves. We continued on the precarious ledges toward the river. 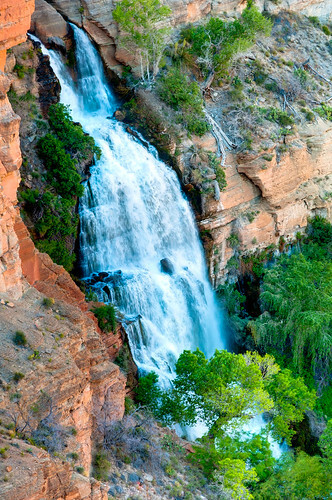 Deer Creek forms a waterfall which flows into the river that is reported to be quite beautiful. We intended to hike down to see it but the trail down to the river was in full sun. It was still quite hot even very late in the day. After enjoying the coolness and the shade of the narrow canyon we simply couldn't talk ourselves into going back out into the sun. We have to content ourselves with looking at photos taken by others. On the third morning the sky was partly cloudy and the temperature decreased as we climbed out of the canyon towards the Esplanade (6.6 miles with 3200 ft of elevation gain). It felt heavenly! By the time we reached the Esplanade (and reclaimed the water we had stashed) some dark clouds had moved in and the wind became quite strong and gusty. It was bad enough that we considered dumping our extra water and hiking the rest of the way out (we saw evidence that others may have chosen this option as we saw bottles of water left by the side of the trail). However, our preference was to stay out if at all possible so we continued on for a ways and eventually found a more sheltered spot. It was such a contrast. The first two nights had been so warm that we both slept naked on top of our sleeping bags and we left the fly off of the tent. 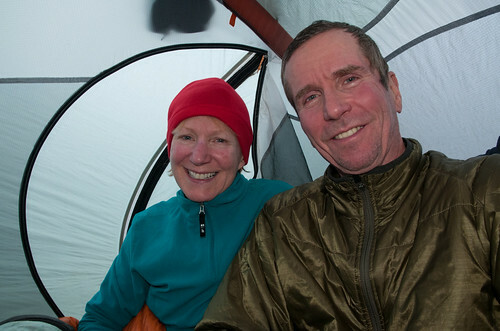 On this third night we slept at least 3,000 ft higher and found that we both needed to wear all of the extra clothes we had felt silly for carrying the past 3 days; 2 long sleeved shirts, an insulated coat, a hat and long underwear bottoms. We later heard it had snowed that night on the North Rim 1800 ft above us. The next morning we were happy to see that the sky had cleared and we could better appreciate the views. 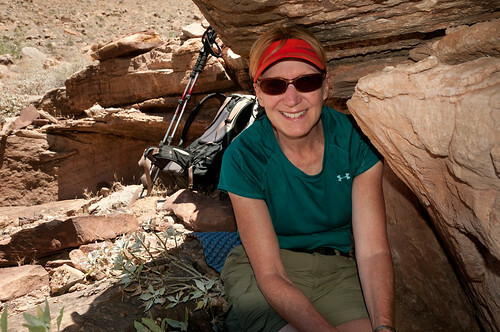 All of our photos of this backpack trip on the Thunder River/Deer Creek Trails are on Flicker. I recently turned 57 and I’ve been feeling old especially my knees. This is discouraging as there is still so much we want to do now that John is retired. Our current “wish list” is extensive (and ambitious). 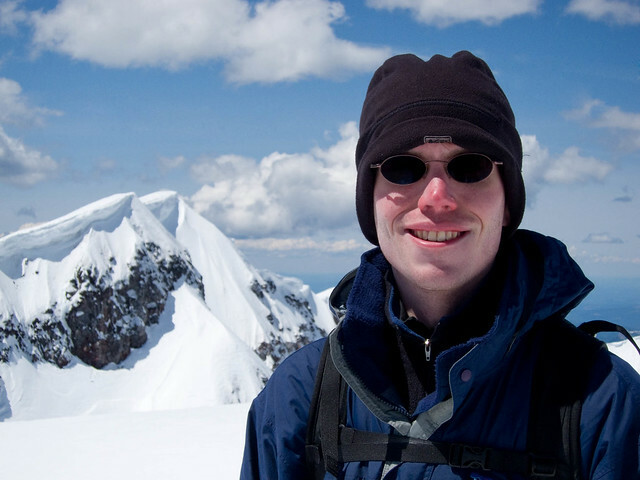 It includes hiking in Peru (not just to Machu Picchu), spending several months exploring New Zealand and Australia, hiking the Pacific Crest Trail from Mexico to Canada, riding our tandem bike across the northern tier of the US and through southern France, hiking in the Swiss Alps, kayaking the Inside Passage, taking a photo cruise to Antarctica, visiting every National Park and National Monument in the US, and spending more time in Canadian Rockies. As many require much physical exertion and we’re not getting any younger (especially me) we realize we need to set some priorities. 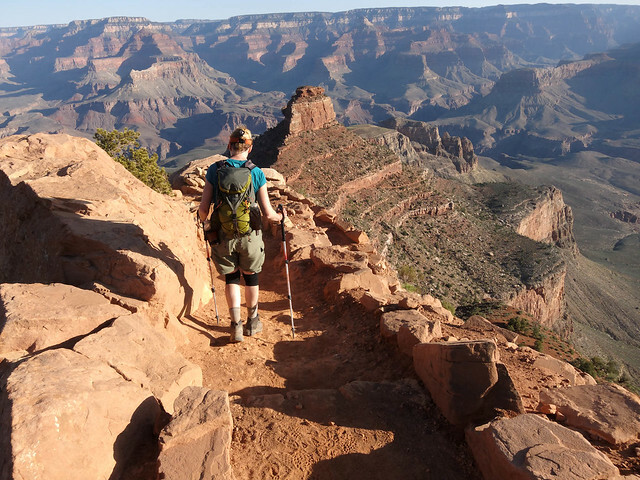 Of those, the most physically demanding is hiking the Pacific Crest Trail (PCT), 2,663 miles done over ~ 6 months, so it would seem it should be at the top of our list. However, we need to be realistic. Given the most recent deterioration in my knees I have come to the disappointing conclusion that I probably can’t do it. John most likely could but is disinclined to do it alone. One option is for us to do it over 2 (or more) summers but that just wouldn’t provide the same sense of accomplishment (nor the “bragging rights”). And as we have just so many “good” summers left to do the more demanding trips we have to decide if we want to devote 2 (or more) of them to the PCT causing us to put off others for years. So it looks like the PCT will come off the list and this is a hard one for both of us to give up and I feel badly because I am the cause. In the past when I’ve been faced with doing something challenging if I could conquer my fear and put my mind to it then my body would just go along without complaint. This is the first time where my head and heart are both willing but my body says “no way!” When did this change occur? It seems like not all that long ago we’d be hiking and could easily pass many of the other hikers on trails. We passed all of the ones with grey hair of course but we both admired those “older” hikers and enjoyed their cheerful attitudes and their eyes that smiled at us from their weather beaten faces. They weren’t going too fast and probably weren’t going as far as we were but they were still going. We were inspired by them. Then over time more hikers began passing us. 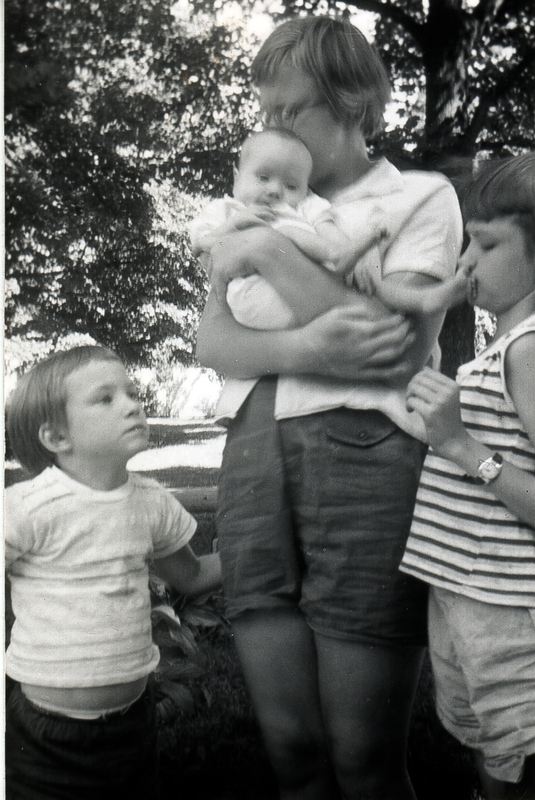 I started consoling myself with the knowledge that we were old enough to be the parents of many of them. 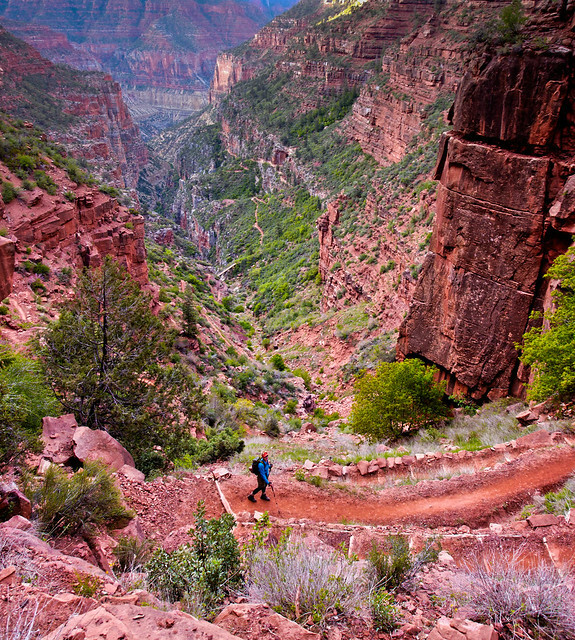 Early on the day we did the Grand Canyon “Rim to Rim” we were passed by quite a few young, fit trail runners. They were soon followed by some young fit hikers but I was okay with that. It still seemed like a big deal for people “our age” to hike 25 miles with ~5,800 ft of elevation loss and ~4,400 ft of gain and I was feeling a little proud of myself. Then we encountered some older dumpier folks who were also doing “Rim to Rim.” A few even passed us. 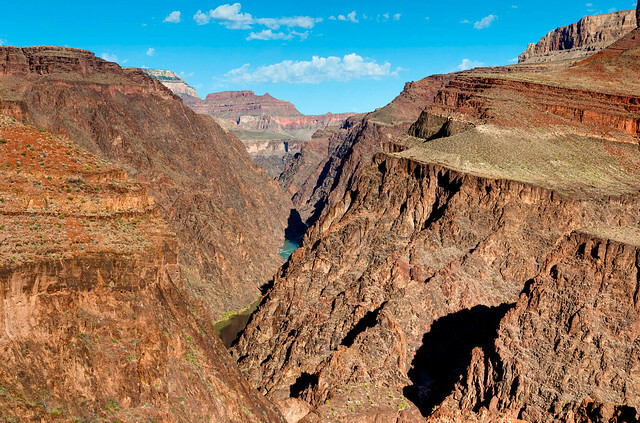 And if that wasn’t bad enough we talked to a grey haired, pot bellied fellow with a bushy mustache also heading up the Bright Angel Trail to the South Rim. After we told him we were hiking Rim to Rim he replied “Yeah, so did we. We started at the South Rim yesterday and hiked to the North Rim and today we’re headed back.” Well…I didn’t feel so proud anymore. 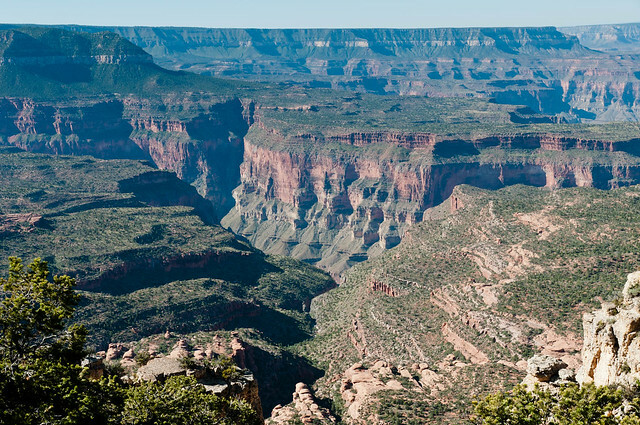 I felt discouraged because I knew there was no way I’d be up for hiking back to the North Rim the next day. 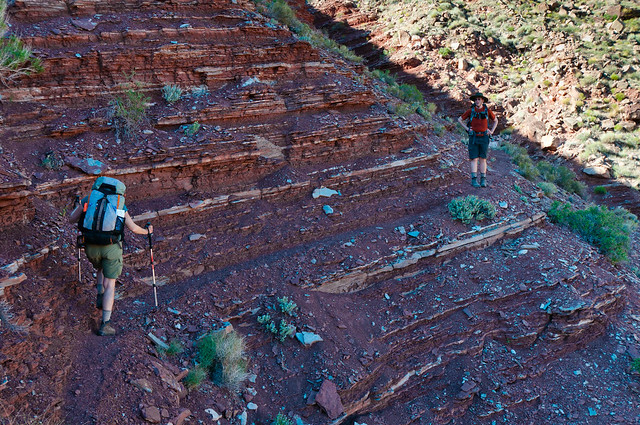 Heading down the North Kaibab trail hiking "Rim to Rim"
Intellectually I realize that I need to come to grips with the fact that I will not be able to do everything we have wanted to do starting with the PCT. But what we can do is scale back our more ambitious goals as needed. 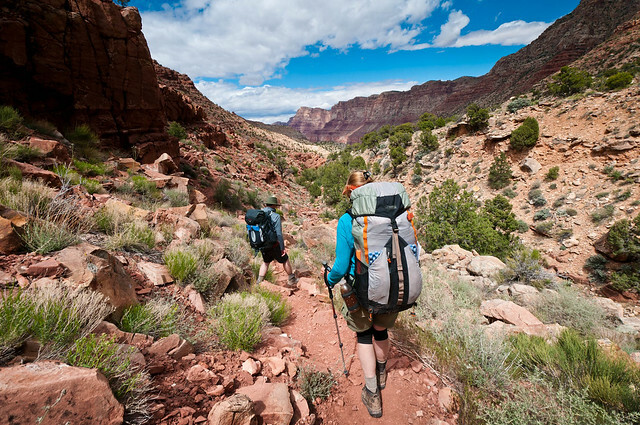 For example, we can do the most scenic portions of the PCT such as hiking the PCT through Washington State. But the best part of the PCT has got to be the John Muir Trail, 211 miles through the Sierra Nevada Range in California. 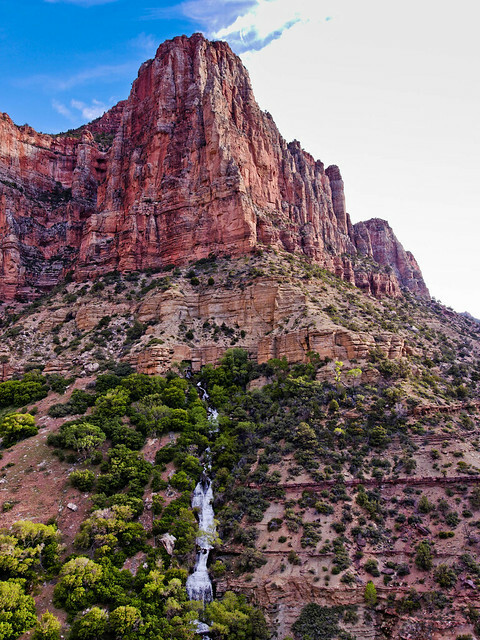 This is considered by many to be the premier hike in the US and we were lucky enough to obtain one of the highly coveted permits beginning in mid August. Our permit allows us to take up to 26 days to complete it so our pace does not have to be grueling. And I’ve been told that compared to the steep grade and extreme elevation gain/loss of the rough trails in the Grand Canyon the JMT is a “walk in the park”... just a very long one at much higher elevations. Of course it will still be a challenge and a ruling factor will be how much food we carry and the distance between the resupply points. We’re considering going 10 days without resupply for the final 100 miles. This would prevent the need to hike 7 miles off trail to the nearest road, then hitchhiking 12 miles into the nearest town and spending a night in a motel before repeating the process to get back to the JMT. We have time for this built into our schedule if need be but we’d prefer to avoid it so we’re planning on just carrying a lot of weight for a while. So yeah, it will be a challenge but my knees are willing to try and I can’t ask for anything more. I also realize I need to come to grips with the fact that I am getting older. I need to choose to feel good about what I can still do rather than bemoan what is now out of reach. 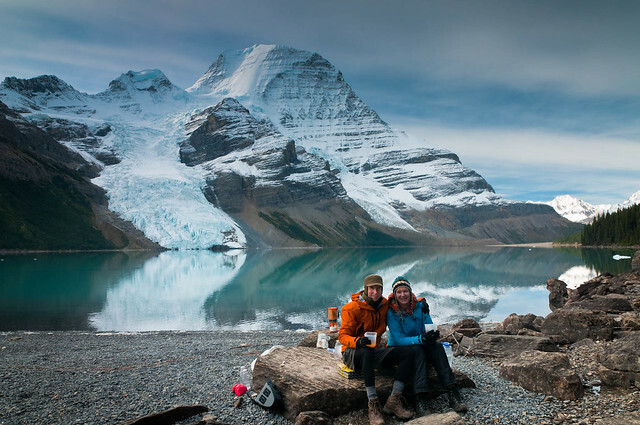 Last summer we met a fellow in his late 20’s while we were backpacking in Tombstone Territorial Park, Yukon. He told us we were an “inspiration” to him. Then in the fall a young man we talked to on our backpack trip in Glacier National Park said how great it was to see “older” people still backpacking. I was taken aback by this initially as I didn’t think we looked all that old. I don’t have grey hair (I color it to match the sunny disposition I wish I had) and I didn’t think either of us looked all that weather beaten yet. But after thinking about it I’ve decided to feel flattered by what these two guys said because even though I’m not going too fast and I may not go as far as they will but I’m still going. And when we are out-hiked by grey haired members of our own generation I don’t have to let their accomplishments diminish my own. Instead I can choose to still be inspired by them. 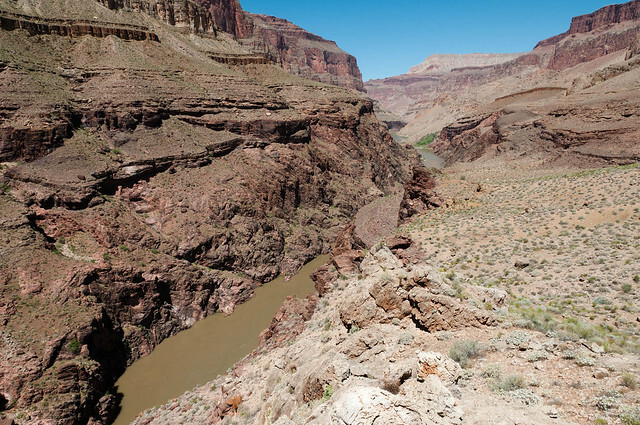 We talked to another fellow on the Bright Angel Trail and when he found out we were hiking Rim to Rim he said “Wow!” I then pointed to pot bellied mustache guy and said “Yeah but see that guy over there? 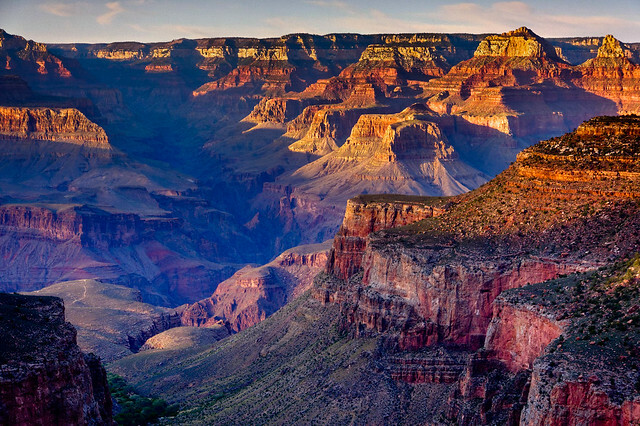 He hiked from the South Rim to the North Rim yesterday and is headed back today.” Wow! So yes, my “clock” is ticking but it sure beats the alternative…having a “clock” that no longer ticks at all. But there is one thing that confuses me. Even though I’m feeling my years physically, emotionally I feel much younger…like I’m still just someone’s little sister. At this point in time it looks like I will just grow old without ever feeling grown up. But then I got to thinking…so what? We’re retired so we don’t have to feel like grownups. Chronological years are irrelevant and our “age” really is a state of mind. We’re “kids” with adult sized resources, we live in a house on wheels and we’re free to play outside whenever we want! What could be better? Beautiful and inspiring as usual. Speaking of which, that last photo does not look like a toadstool--haha. Thanks for bringing us along on your journey! Love the words and pictures. I'm totally with you on getting older and crowds. As far as age retorts, just tell the young'uns "We'll dance on your grave, you young whippersnappers!". Now that you mention it the last photo doesn't look like a toadstool to me either but it does seem oddly familiar somehow. I'll have to ask John if it reminds him of anything. Really cool pictures, nice to have met you on Handies Peak, will look for your pictures in the future.